Pink Gazelle Productions: Authentic Lives…Authentic Works » Squash Anyone? Maryanne playing squash - nice glasses! 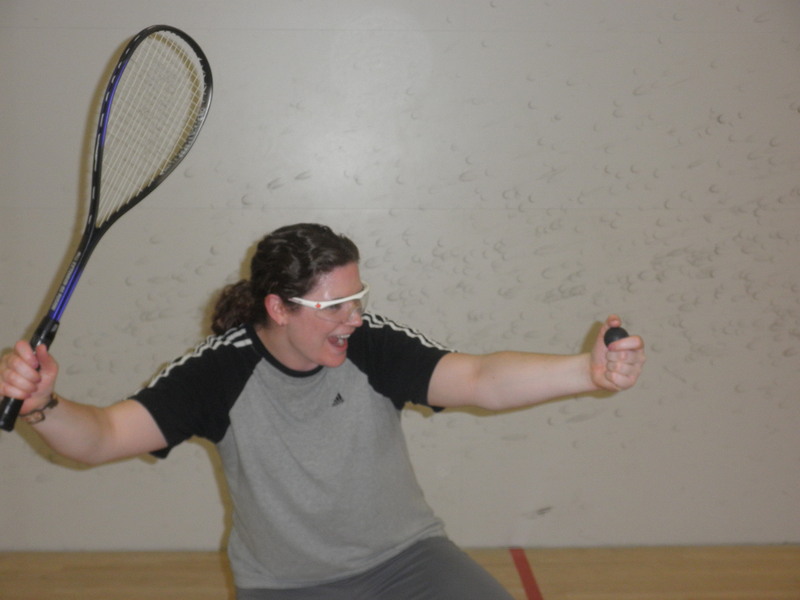 A year ago, I returned to the squash court after a twenty-year hiatus (hence the really outdated safety glasses in the photo above!). I love the game. Unfortunately, I had to stop again because my knee was acting up…too many years spent pounding through the bumps on the ski hill finally caught up to me, I suspect. 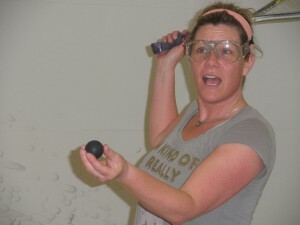 But last spring, my friend Trisha and I had a ball on the squash court. We took weekly lessons from an instructor by the name of Rick, a retired elementary school teacher – which probably explains his patience. Rick broke down the game of squash for us. Here is a summary of what I learned…for as you’ll see, learning to play squash well is perhaps rather like learning to live well. 1. Find the teachers who care enough to teach you, even when they don’t get paid. 2. The best teachers are far more concerned with making you a better player than making you feel better about your game. 3. After the teacher is gone is often when you finally learn the lessons. 4. Take time to learn the basic skills. 5. The goal is to learn to hit the ball well – not just hit it. 6. Practice the basic skills over and over again until you’ve mastered them. 7. Good skills become good habits. 8. If you have developed good habits, when game time comes these will automatically kick in. 9. There is a difference between being taught skills and actually learning them. 10. The more you put your entire self into hitting the ball, the more impactful your efforts will be. 11. Learn skills first; strategy second. 12. Practice the skills on your own before rallying with a partner. 13. Practice one component of the skill over and over again before moving on to the next component. 14. Know the difference between a rally and a game. a) A rally is when you hit the ball to your partner so that he or she can return it. b) A game is when you hit the ball to your opponent so that he or she can’t return it. 14. Slow down your rally: the purpose is to develop your skills not score a point. 15. You will NOT win the game if you haven’t mastered the basic skills. And what is “the game” but a happy, peaceful, purposeful life? But, just like in a good game of squash, real life speeds up. So if we don’t have good habits firmly in place, which for me are: proper rest; good nutrition, clear priorities; balance; living within my means; exercise; fun; spending time in nature; ability to say no to unreasonable demands on my time; healthy boundaries in place; time with friends, family and pets; downtime on my own; creative time for writing; time for e-mail and business correspondence; time for household chores; and so on, when life does get busy again, I’ve learned the hard way (more than once) I won’t last very long in the game. But unlike a game of squash, the stakes of losing in life are significantly higher. And then, if I still refuse to admit I’m losing the game, my cluster migraines start again and I am effectively yanked from the court – sidelined – for a month or more. The “game” – what we perceive to be a good life – is different for each of us, of course, as are the costs of losing. However, regardless of our individual situations, if we don’t take time to learn the necessary life skills that will get us from where we are to where we want to go – in as healthy and happy ways as possible – and then practice those skills on our own, then hone them in rallies with the people around us, then we won’t develop the good habits that will become automatic for when game time comes. And game time always comes; if we’re still breathing, we’re technically still in the game. Maryanne Pope is the author of A Widow’s Awakening and the upcoming Barrier Removed; A Tough Love Guide to Achieving Dreams. She is the CEO of Pink Gazelle Productions Inc. and the Board Chair of the John Petropoulos Memorial Fund. Maryanne lives on Vancouver Island, British Columbia. Love the photos – hilarious! Excellent analogy. Squash can teach us many things in addition to being a great workout. Such a good workout in fact that I’m pretty sure that sometimes I wasn’t breathing anymore! But I somehow manges to stay in the game! Nice one MA and you guys cannot let go of those glasses no matter what the pro-shop tells you. Your ability to draw analogies from so many things that you have done and that you do experience in your life is a good one. Something your article got very close to as it relates to learning or growing in the game of life, is accepting that we all get coached. We cannot always decide who our coaches might be or what they’ll coach us on, and that it is alright to look for a coach for things we just can’t know or understand instead of faking it just to fool ourselves that we are in control. An 8 year old can teach us the right way to catch and really look at a bug, a 10 year old can teach us what commitment and hard work really is through a sport, a 13 year old can help us to understand what good friendships really mean or a 15 year old can teach us what being really proud of yourself means and how good that can feel. There are tons of players in the game of life and there is not one single player that cannot coach on something that they just know, do or understand better than somebody else, but if we don’t open up to being coached, then that gift that could have been shared is wasted. Now about practicing your skills on your own before moving into it with a partner – that is a whole other life lesson.